Last year was my year to PR. It was an awesome running year for me. I challenged myself, pushed myself and I was rewarded with a PR in every distance I raced. I’ve been in a serious funk all winter long, but as the winter turns to spring I feel my energy rising and my spirit beginning to soar again. I know my posts have been a bit gloomy lately. I’m not here to bring anyone down, but it helped me considerably to write out what I was feeling over the past few months. For those of you who continue to read my posts and especially those who commented with words of encouragement, thank you so very much. Your words really helped. I set two running goals this year. One is to run a 50 mile ultra marathon. This will most likely happen in September. The second goal is to run a sub-2 hour half marathon. At the close of 2013 my half marathon PR was 2:02:22. Shaving off almost 3 minutes is not an easy feat for me especially when it means going from running an average pace of 9:22/mile to a 9:09/mile average pace. My legs are big and short and as of late they just don’t seem to want to move very quickly despite keeping up with speed work and tempo runs. Marathon training is in full swing. I am really enjoying the plan I’m following. It is a very nice balance of running, strength and yoga. My goal for this marathon was to run fewer days during the week so that I could maintain cross training throughout marathon training. 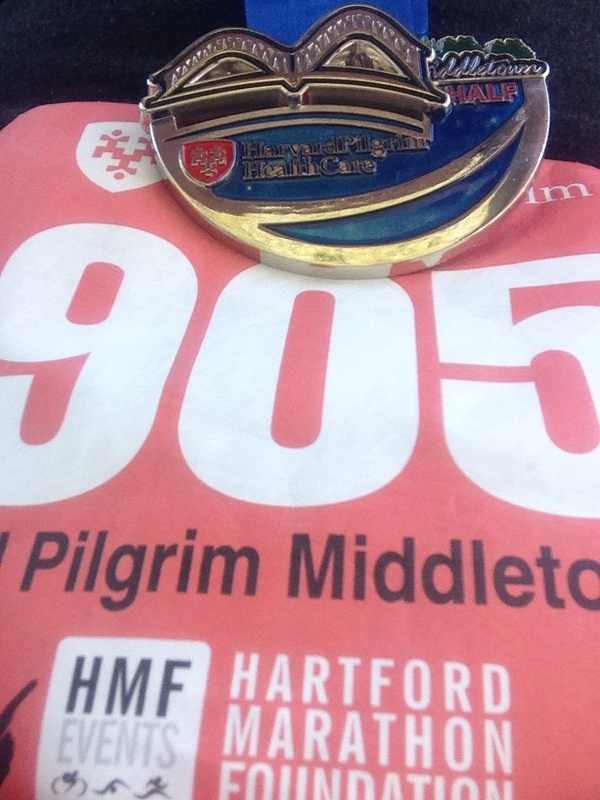 On Sunday, April 6th, I ran the Harvard Pilgrim Half Marathon in Middletown, CT, home of Weslyan University which just happens to be the alma mater of running legends Amby Burfoot, Jeff Galloway and Bill Rodgers. 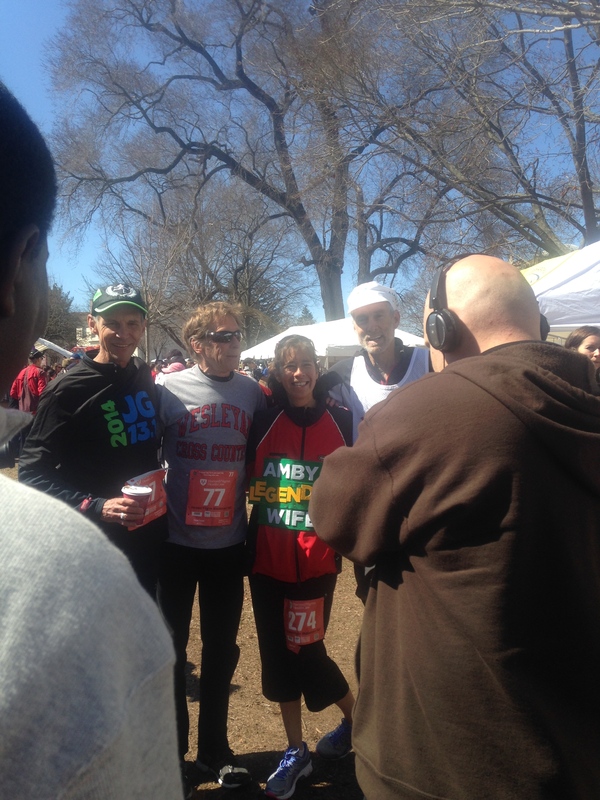 All three were there on Sunday to run the Legends 4 mile race. They were hanging out, taking photos with runners and chatting. There was a long line for a photo so I just snapped one of the guys posing with someone else! They seemed to be really fun, personable and genuinely enjoying the event. The three men met while students at Weslyan University. Ambrose “Amby” Burfoot won the Boston Marathon in 1968 during his senior year at Weslyan. Burfoot is also well known as a running journalist and former editor-in-chief of Runner’s World Magazine. 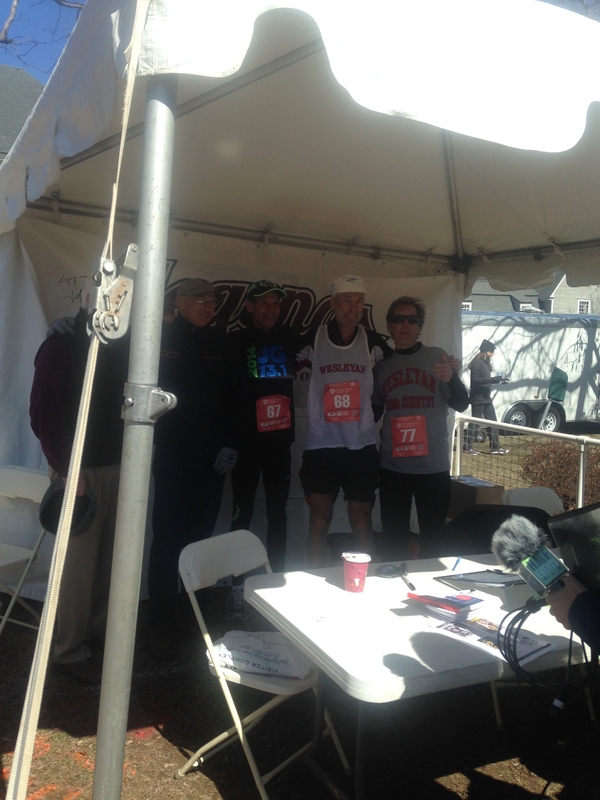 Bill Rodgers is a four time winner of the Boston Marathon. He is an established professional runner and world record holder at various times during his career. He authored the book “Marathon Man,” started the Bill Rodgers Running Center in Boston’s famed Faneuil Hall in 1977 with his brother Charlie, and continues to do appearances at various running events. The Bill Rodgers Running Center recently closed its doors in Boston, but continues to operate online. Having the “legends” there made the race a little more exciting than usual. The day was spectacular given the ridiculously cold temperatures and erratic weather that has made me feel like winter will never end this year. Unfortunately I had to attend the race alone. Carlos had a birthday party to attend mid-day, the race was about an hour away and it was a late 11:30 a.m. start. The race was scheduled as part of my marathon training so I considered it to be my long run for the week. Before the half marathon and Legends 4 miler began there was a short Kids Race. It was awesome because most of the kids wore super hero capes. They were so stinking cute. The race started on Middletown’s quaint Main Street. I found a place in the crowd and started to mentally prepare myself for the race. Ironically the 2 hour pacer got in line to my right. I was actually kind of stunned to see her there because I have never been able to locate the pacers at the start of race and only occasionally have I seen them during a race. This was my first half marathon of the year. I considered it a long training run and although I always aim to run my best race, PR if I can, I didn’t quite feel prepared to run a sub-2 hour half marathon. As I mentioned my training had been less than stellar up to this point. I wasn’t feeling great physically or mentally about running. I felt a little knot in my stomach as the race started and I decided at that moment to really “run” this race. I began slightly ahead of the 2 hour pacer. I was hoping to give myself a little room between us so I could guarantee a sub-2 hour finish. The course immediately headed up a large hill. The hills kept coming, one after another and then we repeated a hilly section. I hung on ahead of the pacer for the first 4 miles or so. Somewhere between mile 5 she pulled ahead of me at a water stop. My legs were on fire from the hill work. I knew I went out too fast and really didn’t have it in me to keep up the pace I had been running. Since I don’t wear my Garmin I wasn’t sure how fast that was, but my legs sensed the intensity. I managed to catch up to the pacer and stayed as close behind her as I could without stumbling into her. Between miles 5-7 she got further and further away from me. By mile 8 she was a yellow dot in the distance and soon thereafter she disappeared from my sight. I didn’t lose my spirit though. I pushed on knowing I was still running my best race. At mile 9 I noticed the time clock and instantly went into mental math mode. Some quick calculations let me know that I could still finish in under two hours if I could keep up my pace. I was a bit confused, but decided to go for it. For some reason the miles flew by. It was a pretty course and the day had actually grown warm. I was enjoying the new scenery and the weather. I felt better on that day than I had in months. I dug really deep in those last 4 miles. The hills were not as frequent, but continued nonetheless. Although I was unfamiliar with the course I knew we were coming towards the end as we looped past the Weslyan campus again and turned left down the hill we conquered at the very beginning of the race. I tore down that hill like a cheetah. I pumped my legs as fast as they could go and breathlessly turned right back onto Main Street. Sprint finishes are not my strong suit, but I was so determined to fight to this finish that I sprinted as fast as my legs could go. When, at last, I caught sight of the time clock tears sprung into my eyes when I noticed the 1 at the beginning of the time. I was so damn proud of myself in that moment. I did it! I finally reached my goal of running a sub-2 hour half marathon. This was supposed to be a warm up half marathon to gauge my pace and my progress. I honestly never expected to PR let alone hit my goal. I was beyond amazed at my finish time of 1:58:30!!! I still am! As I passed through the finish chute tears clouded my vision. I felt a surge of emotions for different reasons. I almost always tear up a bit at the end of a PR race, but this was really special to me. It has been a silent goal of mine since my first half marathon. I’ve worked very hard for it. I felt a bit of sadness that no one was there to see me finish. However, a woman came up behind me just as I slowed to a walk. She patted me on the back to congratulate me and as I turned she noticed my water filled eyes. I told her I had just accomplished my first sub-2 hour half. The woman and her friend gave me congratulatory high fives. They clearly understood my joy. I wore my medal and a huge smile all the way home. Haha, you may have been surprised by the clock but I wasn’t! I totally knew a sub-2 was right around the corner for you. On a hilly course training run no less! Very nice!!! I have a feeling this is going to be another amazing year for you, even if you felt like it got off to a slow start. Happy for you! 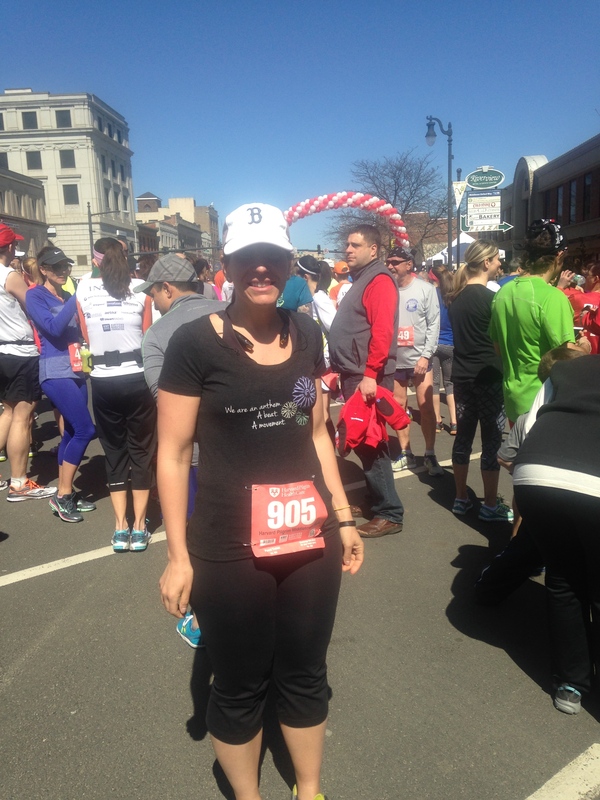 Aimee…that was an awesome run! Congratulations 🙂 I knew you had it in you!! 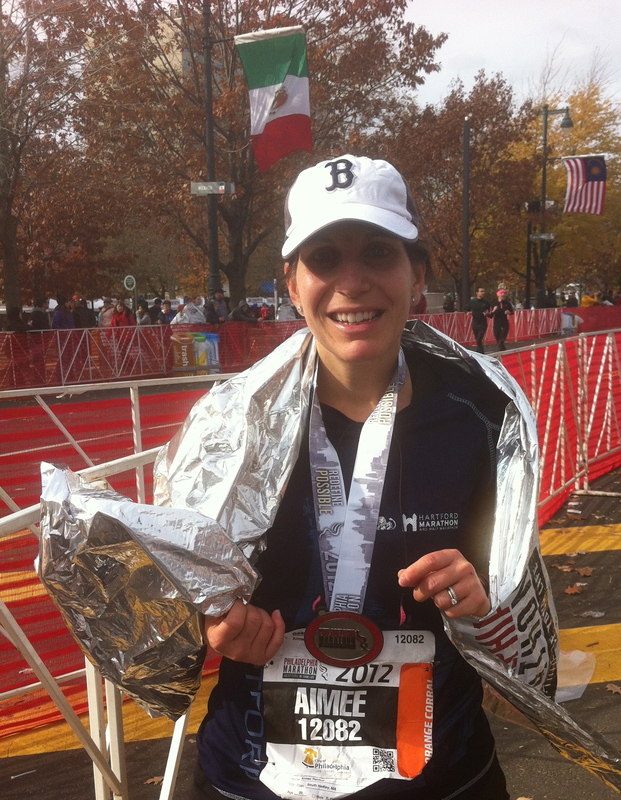 Congratulations on an amazing run, Aimee. 2014 is your year. You’ve got this!